As regular readers know, I am quite devoted to Farmer Ted and the whole Windflower Farm crew. But this week I had occasion to check out another CSA. My coworker and I visited Crown Heights Farm Share to learn about some of the innovative strategies they are using to recruit and retain low-income residents. From what I observed, the folks in Crown Heights have built a remarkable sense of community. 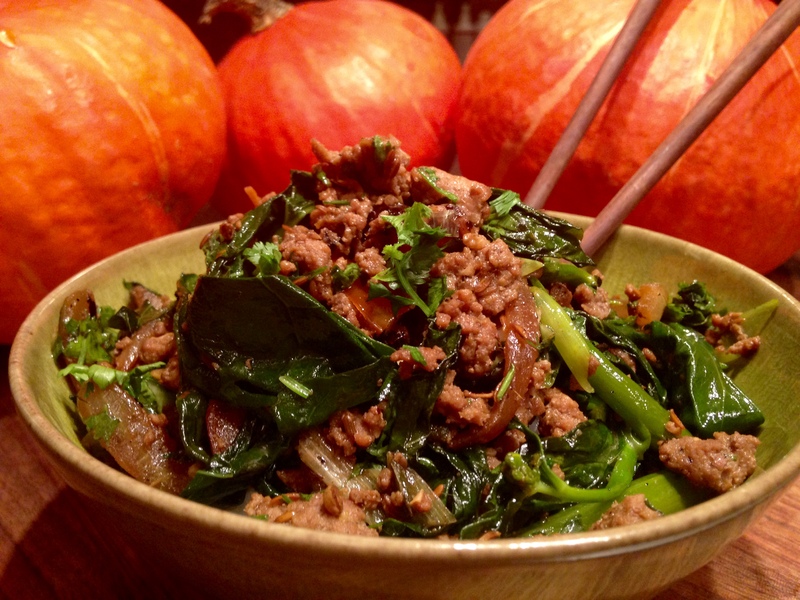 They also have some remarkable vegetables courtesy of Sang Lee Farms, located on the North Fork of Long Island. One of the coordinators we met with was kind enough to send me into the night with a lovely bouquet of guy lon, also known as Chinese broccoli. I made it to my own CSA, which is five blocks away, just before closing time. Good thing I did as, in addition to a delightful selection of vegetables, I picked up a pound of ground lamb that I had ordered during a bout of insomnia the week before and promptly forgotten about. Toast the cumin seeds in a dry cast iron skillet over medium heat, stirring constantly, until they release their aroma and turn a few shades darker. Gently mix the lamb with the cumin, Szechuan peppercorns, tamari or soy sauce, and a good amount of freshly ground black pepper in a bowl and set aside. Pour 2 tablespoons of oil into the skillet and bring it up to medium-high heat. Add the onions and cook, stirring frequently, until they are limp and charred in places. Add the red and jalapeño peppers, allowing these to brown and go limp. Empty the contents of the pan into a bowl. Place the skillet back on the heat and pour in another tablespoon of oil. Add the guy lon stems and let these cook for a few minutes, stirring frequently. 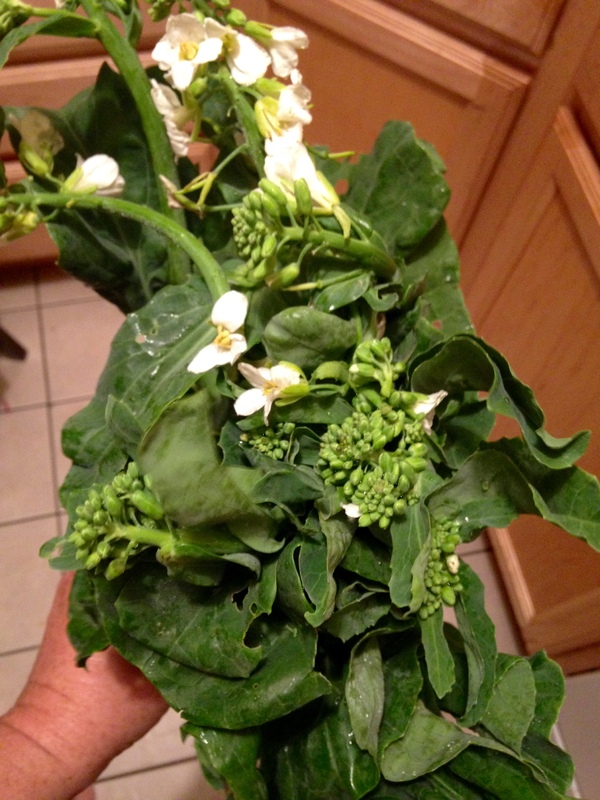 Add the flowers and leaves and cook stirring constantly until the stems are bright green and the leaves are wilted. Dump the guy lon on top of the onions and peppers. Place the skillet back on the heat and pour in the last tablespoon of oil, followed by the lamb, garlic and rice wine vinegar. Cook stirring frequently for 10 minutes or so until the lamb has released and then reabsorbed most of its juices. Stir the cooked vegetables and the scallions in, and let cook for a couple more minutes. Add the cilantro off the heat. Serve over rice, which should be done right about now. This entry was posted in main courses, meat and tagged guy lon, lamb by Jasmine Nielsen. Bookmark the permalink. I think I could pull this one off.